The Old Foodie: The English Peach. King John of England, who had reigned since 1199, died in Newark sometime during the night of October 18-19th 1216, some say from overindulging in peaches at a banquet nine days before. King John had a lot of enemies amongst his own barons and the clergy, and there are many rumours as to the cause of his death. Perhaps he was poisoned (with ale or plums) by the monks at Swinehead Abbey, probably he caught dysentery (or an “ague”) while retreating from the French across the marches of East Anglia, but just maybe his own greed did get the better of him. The “surfeit of peaches” (with or without an accompanying surfeit of either ale or wine or cider) story wont go away, and history as she is wrote in most ordinary texts has determined him a bad king – irritable, irreligious, capable of murdering his own nephew, incapable of defending Britains territory in Normandy – and greedy into the bargain. Peaches probably originated in China, whence they travelled the Silk Road to the Middle East and the Mediterranean - to the delight first of the Greeks, and later the Romans, who then introduced them throughout their empire. There is a record of peaches being planted in the gardens of the Tower of London in 1272, but they were not cultivated to any extent until the mid-sixteenth century, and then only in very lucky sheltered warm spots. So – peaches would certainly have been available in Britain at the time of King John, and he would surely have availed himself of them if he could. There are some hints that he had an interest in food. The first English food quality law – the Assize of Bread - was enacted during his reign, and also we know he fined the city of Gloucester for not fulfilling their obligation to provide a tithe of lampreys to the royal household. But death by peaches in England in mid-October? It seems a little far-fetched a theory. 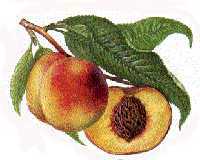 Peaches can be preserved of course – either in syrup (or honey) and by drying – but sugar was an expensive, exotic “spice” until sugar refining began in England in the mid-sixteenth century. When the English did start preserving fruit with sugar, they did so with great creativity. Marmalade was once a solid preserve, more like the quince paste we serve with cheese today. The mixture was cut into shapes when it was cool, or pressed into moulds which printed a design on the surface. Here is a sixteenth century recipe for a peach “marmelet” made even more fragrant with rosewater. To make drie Marmelet of Peches. Take your Peaches and pare them and cut them from the stones, and mince them very finely and steepe them in rosewater, then straine them with rosewater through a course cloth or Strainer into your Pan that you will seethe it in, you must have to every pound of peches halfe a pound of suger finely beaten, and put it into your pan that you do boile it in, you must reserve out a good quantity to mould your cakes or prints withall, of that Suger, then set your pan on the fire, and stir it til it be thick or stiffe that your stick wil stand upright in it of it self, then take it up and lay it in a platter or charger in prety lumps as big as you wil have the mould or printes, and when it is colde print it on a faire boord with suger, and print them on a mould or what know or fashion you will, & bake in an earthen pot or pan upon the embers or in a feate cover, and keep them continually by the fire to keep them dry. I remember his showing me how to eat a peach by building a little white mountain of sugar and then dripping the peach into it. Mary McCarthy. Wonderful information. I've linked to this page on my own blog page discussing peaches.